Are you interested in what numbers can tell us? Here at the library we use statistics to help us make decisions about what our patrons want to read or what services they find most useful. For instance, after installing a Self-Check-Out station near the first floor elevator, we saw that about 10% of our total circulation had taken place at that station. Many of our users prefer online databases and electronic journals, which explains why we have about 275 databases and over 11,000 e-journals available for remote access by Villanova students, staff and faculty. Many of these items are not available to the general public, even through Google Scholar or other powerful search engines and commercial databases. These services are provided free of charge to Villanova students, staff and faculty. If any given article from a commercial provider were to cost $10 each (a conservative estimate) and 7700 patrons requested those articles (we received over 7700 Interlibrary Loan requests for articles this year), those articles would have cost library patrons $77,000.00. 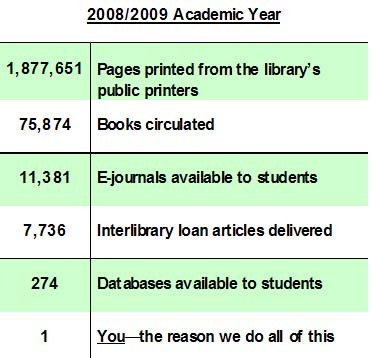 Our public printers were used to print almost 2 million pages over the course of one year, more than any other public printing location on campus. Fortunately, students have print allotments that defray the cost of printing. Not only do we count the number of times resources are used in Falvey Library, we listen to your feedback about them. If you have information that could help us improve the library, tell us in the Comments section below. I’m not sure that print allotments reduce the number of pages printed. Maybe if there were no allotments and students paid as needed, there wouldn’t be stacks of print-outs at the end of the day that students don’t pick up. A reduction of mass powerpoint print jobs would also do wonders for the inconsistency of the printers. The Library’s proactive efforts at bettering itself make it the best administered and most forward looking unit on Campus. Keep it up!